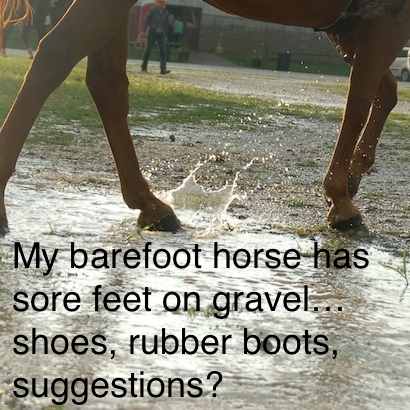 My barefoot horse has sore feet on gravel…shoes, rubber boots, suggestions? “Hi Stacy. I have a question for you. I am a reasonably new horse owner and my 18 year old quarter horse has flat feet. At this point she is bare foot. We have her on a good nutrition routine and regular farrier visits. But I noticed that she avoids gravel at every chance and I took her out trail riding last week and it was a struggle to keep her on the path and off of the grassy area on the side where she was running me into the trees. Of course the suggestion is put shoes on her. But I am reading that shoes are not that great full time on a horse. So I am considering rubber boots that I would put on her when she is out in the pasture. I am interested in your opinion boots or shoes?” -Laurie A. From your description it seems fair to say that your horse is trying to tell you that the gravel hurts. It also sounds like this was an issue for you when you were trail riding…but then you also add considering boots for her when she is in the pasture also. Is there gravel or hard ground in your pasture? Or do you have a reason to believe that she is sore in the pasture also? I mention this because it may change some of the comments or the way that you make your decision. For example, I have owned horses that I kept barefoot. Some of them were sensitive going across gravel, but gravel wasn’t part of their normal routine so it was easy to work around it. They were fine in the pastures, arenas and dirt trails. As long as I avoided blacktop with loose gravel on top or rough gravel they were fine. There are many options out there and many opinions of what works and what doesn’t. I think that it is wise to consider that each horse is unique as are the situations that they will be put in. Those are questions you need to answer. For example, I show in reining and to slide the horses need sliding shoes. I leave all my horses barefoot in the front as long as I can…some of my horses stay barefoot in the front year-round…others end up with front shoes on. It depends on the horse. I do pull shoes off and leave horses barefoot during any downtimes that we have, for example if we are not showing over the winter then they are often barefoot and turned out. I know that EZ Boots for horses have come a long way over the years. I met a woman who rides competitive endurance rides wearing EZ Boots…which means that they can work well in tough conditions. She did tell me that they worked best on horses with a very ‘normal’ shaped hoof. Horses with longer, narrow shapes for example were more likely to throw the boot off (from what I was told). I haven’t heard of someone leaving these boots on in the pasture. I would be concerned with holding moisture against the hoof, plus most of mine would probably try chewing them off for fun. I am hoping that some people who use them will leave comments. If I were looking to mostly trail ride and my horse was fine barefoot in the pasture then I would probably try the EZ boots and skip shoeing. If you wanted to try shoes you could do that also. It is completely possible to put shoes on for a few months and then change your mind. When I was a kid we kept the horses barefoot almost all the time. The exception was around August when the ground got dry and hard, we were riding a lot and the horses would get a little foot sore. We were riding the same trails we had been from April until then but they still got tender. We would put shoes on to finish the summer and fall and then when the weather got rainy, school started and we rode less…we would pull the shoes off. The two or three times we would ride a week didn’t bother them and they usually didn’t see shoes again until late the next summer. I think this question will depend mostly on you and your horse. Is keeping her barefoot and avoiding the stones possible? If so then consider it. If she is even getting sore in the pasture then you may need to consider something else. If she is only ‘ouchy’ on gravel when you ride…consider trying the boots. Or if you have a good farrier don’t be afraid to try shoes also. ← Mini horses find their purpose in life. Is it good trying boots for a horse? I’m really worried about my horse, even though the above comments give me a better idea of using it, but still confused about choosing it. I have Cavello sport boots for my pony and she is a totaly different horse when out for a ride. Who wouldn’t be when your feet don’t hurt anymore. I bought them for another horse who hated to go down the gravel road but sold him before I got to try them. I only use them for riding. With regards to the girl with the sore barefoot horse. I have a 16 yr. old horse which I have only had shoes on once in her life for a very short spell. I have never put shoes on her again in 16 yrs. I have rode her in the e-zee boots of long ago. Hard to get on & off but worked ok. I now use the cavello boots which I love. She is great in them & they are easy to take on & off. These same boots are now used by people that do endurance riding. The only reason I went to these is because my horse needed some reconstructed surgery on her hoof. They had to remove a fairly large chunk of the front of the hoof. Luckly I was able to find a great farrier who was able to do this for me & has reconstructed her foot so she is now sound & should be back to herself in a couple more months. I have to keep the material used to reconstruct it as dry as possible so I ride her in the boots & keep her in a stall on wet days.. I love my cavello boots & will continue to use them. I even had to use a boot larger to fit the foot that was fixed until it grows out & she manages OK with two different sizes.Other then that I have always road her barefoot & she has soft feet. No trimmer, just a horse owner who had to make a decision. I have a 12 year old Paso Fino, who was lame with coffin joint synovitis last year, as well as an inflamed tendon. We kept him barefoot, as he was not being ridden and just had him in pasture. So, this was all very well, but coming back to the stable, there is uneven concrete with small gravel. It’s maybe 100 yards from his pasture into his stable — but he was on eggshells the entire time. It got so bad, I put boots on just to lead him from the field to the stable. He actually handed me his foot before we ever got near the gate, just to get his boots, so his feet wouldn’t hurt. People who brought him in when I couldn’t, and who didn’t use the boots…they all commented how he didn’t want to walk out of the field, and then eggshelled it across the yard, clearly in pain. After almost a year without shoes, using boots to ride (when he was sound again) and bring in, and regular farrier / trimmer attendance, I conferred with my vet, the farrier and the trimmer. I didn’t want him to be in pain, in was that simple. His hooves are great. No problems there, other than being extremely sensitive to rocky, uneven, or gravel ground. The farrier is scratching his head, so is the vet and the trimmer. He shouldn’t be in pain barefoot — but he is. After consulting with everyone, we shod on all fours again. He’s 100% better with shoes, so the shoes stay. So, I would try boots first. I never put boots on in pasture, as he was okay there. If the horse needs boots in pasture…then I’d say talk to your vet and farrier and see what they recommend. A good farrier is worth his weight in gold, btw. And a good farrier will recommend what is best for the horse, whether it’s shoes, boots, or barefoot. I choose to keep my horse barefoot year round. She lives in a pasture, we don’t compete, and we rarely ride for long distances. She also has the hardest bare feet of any horse I’ve ever seen. My farrier has also made that comment. I am considering using some EZ boots on the front if I take her on a pretty rocky trail, but for most of the time, we just ride around in the pasture, or on the road in our neighborhood. I had an older mule who developed IR and later laminitis. Our pastures are somewhat rocky in spots so her feet needed to be protected even after she recovered. My vet recommended ‘Soft Ride’ boots which worked wonderfully for her. She wore them all the time and I took the off weekly and cleaned her feet and the boots. One set would last her about a year. She was in her fourth year of wearing them when she had to be put down for other health issues. She would occasionally loose one in the pasture but it would be found pretty easily. I use boots only on the front but one of these days I will probably invest in another pair, although he seems to be fine without back ones. My friend uses the gators on her horse and likes them. Her horse is very tender footed, as well, so the combo seem to really work for him. I will probably get a pair just too make the boots more comfy for my boy! Good comments here. Concavity of the hoof can be developed in many animals and is a factor in horse comfort. My ponies have been barefoot for years now. I ride and drive them. The toughness of the hoof varies depending on time of year and amount of work on various surfaces. Most recently, I drove over 8 miles on gravel roads barefoot. (This is the drier months when hooves were toughest, not in spring when soft from rain.) I also have boots for them to use as needed. I read a comment that barefoot trimmers should require boots as part of the transition program in horses going from metal shoes to barefoot and for those growing a “new” hoof from injury, genetics or poor hoof care in the past. I completely agree with this. Boots should be seen as necessary even if only used as needed which is the goal in my humble opinion. Yes I know they’re expensive BUT when you compare that to metal shoes, they are much cheaper in the long run usually. Especially if your farrier is kind enough to help you learn to trim some yourself as I do. My animals have gravel in their run in shed and I would like to add gravel around the water trough. Pea gravel is best but river gravel can work also and may be a bit cheaper of you plan to cover a large area. (I’d love to have my entire barn lot graveled as much of it would work in and prevent deep mud in the spring.) They always have a grass turn out adjoining though and I take care to open/close the runs as needed. (Gotta love electric fence for this!) Areas that are muddy or wet much of the time are not good for the hooves so if this describes the pen the horse is, modifications of some sort are a necessity. I’ve used boa boots on a gaited Ten. Walking Horse with great success but it is as someone here commented, particular brands fit certain shaped hooves better than others. (Some fit round, some narrow, etc) It’s been some years ago now so my memory is foggy but I believe I had to use some gaiters to prevent rubs to the pasterns. I now use Swiss boots on the main drive/ride pony and on a VERY gaited Mo. Fox Trotter. The MFT is the newest one to be booted and I have limited experience with this combo but the boots do seem to make her trip more. I plan to let her wear them several hours a day in her pen to see if that helps. She only has them for the front but I don’t ride her enough to need a set for the back. The ride/drive pony has them for all four. Interestingly, if an animal is ridden, the fronts will wear first/more. If driven, the hinds wear the most. I found the hinds harder to fit BUT one reason I chose Swiss boots is that the Barefoot Trimmer fits them and is a resource to help solve any issues and to purchase replacement straps or whatever may be needed. Just prior to the Swiss boots, I tried another “off the shelf” boot…can’t recall which brand but the issue was that to return them they had to be in new and unused condition. How can you try them on AND see if they’ll work and them still be in new condition? Also, many off the shelf boots are tight above the coronary band and will most likely rub without gaiters. The Swiss boots aren’t fitted in that area (unless they’re not fitted correctly) so do not require anything but the boot which is easy on/off….again, when fitted correctly. Now don’t think that boots will protect so well the horse will NEVER give to a rock or stumble. Mine will quickly move off a largish, sharpish rock in the sole area while wearing boots but there is no damage/bruise to the hoof and they will walk in the rough areas instead of insisting on walking on the edge or wherever it is softer. My horse has been barefoot all his 8 yrs. I have been able to get away without using anything up until this past summer when we took him to a ranch for some cow work on some pretty tough terrain. I bought the boots, had just enough time to get him used to the feel in my round pen, then nervously put them on for our first day in timber. I put some balm on his heel to help with rubbing. We ended up being out for 8 hours straight and they worked perfectly with no rubbing at all! Saved his feet from some rocky terrain without any issues. Caballos is the brand and I only used them on his front feet. I wouldn’t keep boots on in the pasture because of the moisture issues, and even if there is gravel areas- can she avoid them? Conditioning her hooves with pea gravel is a good idea, but only if it’s a real big issue that she won’t walk on it. I have a Tennessee walker that has more of a flat sole and he gets a bit tender on the gravel paths while trail riding, but the gravel portion is short so we just weave through the trees until it’s clear. He was shod when I got him, and I pulled the shoes because his frogs were in bad shape and the hoof was unhealthy from not getting the proper circulation, shoes restrict the natural flex and movement of the hoof. Shoes have advantages for a working horse, they can protect the hoof, but like several of the comments say- they are removed for the winter months when the horse is out of a job. The EZ boot is an excellent option, it still allows the hoof it’s natural movement, and protects it from rough terrain. The supplier will actually send you a fit kit so you can measure and determine the size your horse needs. My other trail horse is a Mustang, and his hooves are the opposite of the Walkers, he actually prefers to stay on the gravel trail, when I redirect him onto the grass he will just walk back over to the gravel. His hoofs are very solid and healthy, I’ve never had an issue with him being barefoot (knock on wood! ), because he was born walking on various terrain. I’ve even ridden him in the creeks where he will go over big rocks and boulders. So, having both ends of the hoof world, I would suggest to try the EZ boots first. If they don’t work for her, you can always try shoes. Just know that gravel gives, and will still put pressure on the sole when the shod hoof sinks down into it. I had a flat-footed horse recently and believe me, I pumped him with supplements, I used hoof oil, etc. And don’t get me wrong — he had STRONG feet…but all that stuff did nothing to fix his lack of cup on the bottom. He needed help — so I shod him. I’m always an advocate of shoeing a horse if you’re trail riding all the time and/or taking the horse over rough terrain. For 30 years we’ve had horses that wear shoes all riding season in Minnesota (so ~late April through ~end of October) and they’ve never had any problems. That being said, if you’re going to use boots — whichever kind work for your horse(s) — and you’re consistently riding over rough terrain, then always use the boots when riding. As long as you get the horse used to them without throwing them on for the first time and riding for 5 hours up and down mountains 🙂 We’ve purchased Easyboots (for if our horses throw a shoe) and I’ve used both the Trail and Glove; they work great. I’d recommend the Glove over the Trail; if your horse isn’t used to wearing boots (as ours aren’t) we’ve found the Trail can chafe them a bit on longer rides. I find this topic of conversation — and controversy — fascinating. I’m always amazed at people who don’t believe in shoeing a horse (or even putting boots on it), even though the riding they do and the horse’s feet warrant it. Such as in this case, where the horse has flat feet. You can’t “build” a cupped foot on a flat-footed horse, and you can paint as much “hoof hardening” substance as you want on it; that’s not the issue. The issue is the horse can’t get the bottom of their hoof “up” off the rough terrain naturally (no cup) so we have to step in and add tools so the horse can cope with what we’re asking them to do (i.e., shoe them or put boots on them). If we, as humans who ride horses, want to take our equines over rough terrain or ask them to do other things (like reining sliding stops) that aren’t “natural” to them, then we need to supply them with the tools they need to DO the job we’re asking. And that’s okay! I think this blog was just trying to offer suggestions and, in the end, she has to make her own decisions. I haven’t read anything that hinted of the controversy, ‘to shoe or not to shoe’ here. I have been using the EZ boot Glove on my trail gelding for 2years now and love them. I have never lost a boot and only put them on him as needed according to rocky terrain. I personally think they can be a lot of work to put on, but prefer them over nail on shoes. My barefoot trimmer said they should not be left on for more than 6 hours because of the moisture building up. The only down side I have found is sand and tiny gravel can work their way into the boot at times and can be abrasive to the heel bulb area. For that reason I would never leave these boots on while pasturing my horse. Get a well trained Bare-foot trimmer, not a farrier. Have been using a bare foot trimmer for 7 yrs. now, and can pretty much ride anywhere now,gravel, mountain riding etc. Use boots once in awhile, mostly if riding in the mountains on really rocky terrain. The best part is that it is a lot cheaper than shoeing! I used Simple Boot for a while but the right one came off 4 times and I found it 3 times! I bought a smaller size but it didn’t fit. My horse is a Walker and I think he pulled it off with his over step. He just goes barefoot all the time now. I live in rocky territory in NW PA (about 25 miles from Miracle Mountain) but he has toughened up over the 5 years I’ve had him. Sometimes he goes to the side of a very stony trail but I don’t want to shoe him. It’s a dilemma when you live where it’s rocky. My horse is very tender foot it on the front. I bought ground control horseshoes. They are a type of plastic or shoes that cover covers the Frog as well. They work great. 10 years ago I bought easy boots for all four feet of our two trail horses. The only downside I can think of is the bending grunting and sweating involved in putting them on in the summer before a ride. We would ride up and down the mountains, on gravel, on muddy trails, in pouring rain storms, crossing rivers with sandy bottoms and some with large rocky bottoms you had to pick through. We never ever lost a boot. Used the fetlock wraps with them and never had a rubbed area. Our rides were usually 6-8 hours…sometimes longer. I still have these boots. Just used two last weekend on the back feet for a trail ride. The new ones look nicer but I don’t believe I will ever have them as my old ones are still great! I have had my horses barefoot for about 6 years now and we have the worst trails! They have hard ground and some sharp rocks to travel over. I love Renegade boots. I find them the easiest to get on and off the horse and if your horse is a little overdue for trimming they have a little forgiveness in them. I have never had to leave boots on in the paddock. I have also put gravel (river stones -rounded not sharp) in front of my water trough as I found out early in my barefoot transition that it helps toughen their feet up. I have also used Easyboot Gloves and found them excellent but you have to be right on your trimming schedule otherwise you can’t get them on. My Quater mare also has flat feet, but my goal is to keep her bare foot as long as possible. Besides a regular trim (every 5 to 6 weeks) my farrier fit her with rubber boots. She had a wide variety of molds for differtent styles and models and we found out that the Renegade boot fits the best. We use it out on the trails and it works great. I think finding the right boot is essential. I used EZ boots on one of my mares who had very tender feet. They worked well in protecting her feet and making her more comfortable on gravel/hard, rough surfaces, but I didn’t find them particularly easy to put on. I switched to Renegade boots and I liked them a lot better. They were much easier to put on and offered just as much comfort and protection. I would also get a second opinion on shoes for a flat footed mare – it’s one of those “cut your losses” situations where shoes may not be the best thing for some horses, but if it means sacrificing your horse’s comfort just to go with an ideal, you might want to re-think. I did have a horse who unless I kept boots on her full-time was just always foot sore because of weak hooves (no matter how much nutritional and supplemental support she had – she was a rescue and her hooves were shot) and my farrier (who liked to keep horses barefoot as much as possible) finally said she’d be miserable without shoes to take the pain off her poor, tender feet. And he was right, she was a totally different horse once she got shoes on and much, much happier. My horses are barefoot trimmed and most of the time I ride without boots. But, on a long or rocky ride, I use renegade boots http://www.renegadehoofboots.com/. They allow the horse natural movement of the ankle and hoof and have worked well for my 3 barefooters. We’ve tried several boots for my navicular QH to keep him comfortable while barefoot. For riding, Easy Boot Gloves are our favorite. They are easy to take on and off, stay on great, no rubs or sores, less bulky than Old Mac G2 (he worried about his feet more in those, like he didn’t want to get caught up in something on the trail). Do recommend that you invest the time up front to get the right fit. We also swear by Soft-Ride boots and have used them for turnout, even in mucky western WA. I’ve been astonished that we’re less likely to lose a boot getting sucked off in knee deep mud, and more likely that frisky boy will toss them off flying up the hill to the barn (lots easier to find that way). His feet stay surprisingly dry in them, although he does get to come in at night to dry out. Our preferred routine, when possible, is boots on during turn out and off at night. He practically picks up his feet and hands them to me to put the boots on. He loves them! And his feet have gradually gotten stronger so we have to use the boots less when barefoot in the winter, unless a super wet year and feet don’t have a chance. So glad to have the boots for back up so we can keep from going back into the pain and inflammation cycle. I had rubber shoes (as in nailed on) for two of my geldings. My quarter they worked fantastic for, he got sore on gravel and there are several areas of the trails I ride weekly that are gravely. The other guy (Mr. Crappy Appy feet), not so much. With how he moves, he actually sheared them off because they are grippy-er than metal shoes. He’d pivot and just lose a shoe walking around the barnyard. Shod with metal, he usually kept them on.They were nice though because a single set would last pretty much a whole summer of riding. Now both are barefoot though (and semi-retired). I have some trail buddies who are using Cavello boots. They got the first set for an older boy with navicular and they’re so happy with them they bought a set for each trail horse. My haflinger on the other hand will probably never need shoes, gravel, concrete, etc, doesn’t bother him. He’s been barefoot his whole life. We use Renegade hoof boots. They have many different sizes to choose from, plus they are adjustable. Also, they have great colors to choose from. They’ve worked well for me and my horses these last few years. I use EZ boots on my mare when the trail is rocky. She goes well in them, and they go off and on easily. The key is correct fitting. It took us a few tries to get the right size in spite of a lot of measuring. I try to avoid gravel. It’s not comfortable for me to walk on either – even with shoes! All of our horses go barefoot with a natural hoof trim. Building a good, hard hoof from the inside is the key, I think. It takes a long time, sometimes up to a year. All of our horses get hoof supplement, regular trims with a great farrier and hoof oil painted on their hooves when the ground is hard and the weather is hot. In the summer, we also let one area around a water tank stay wet so their hooves have a chance to be moist. There are many different types of boots. Should you decide to use them 24/7, you would need to remove them at one point or another to allow them to air out, avoiding thrush. The flat feet would be the main cause of the sore footedness as it does not allow the gravel to move underneath the hoof. The cause of the flat feet would need to be addressed in order to fix this. A hoof should not be long and narrow, etc. Usually that means the horse’s toes are too long and the heels are underrun, which is usually able to be fixed by bringing back the horse’s toes and bring the heels to where they should be. I am strongly against shoes having experienced my horses with and without shoes and finding their feet to be MUCH healthier without shoes. I have also had a lot of success in correcting “problem” feet (including a foundered horse with 12 degrees of rotation whom is now sound and will be getting her second x-ray soon) using the ABC Hoofprint Method that trims to the internal structure of the hoof. Good luck! You can also paint the sole, or bottom, of her feet with Venice terpentine. That will toughen up her soles. This is true, we have done this with some horses and found that it did help some of them. I am in the exact same boat as the gal writing this question but I have one more question to add to this. Someone suggested to put gravel down in a commonly travelled area in the pasture to have your horse become more accustomed to the surface. What do you think of this idea Stacy? I could see where it might help in some…it is one of the reasons I was curious if the horse already had gravel in the pasture (she mentioned needing boots in the pasture). I haven’t tried it myself. It does help normally. Think of it like your own feet, if you walk around on grass all the time, it hurts on gravel but, if you walk around on gravel lots, you don’t notice it! Pea gravel is really good for rehabbing horses. I keep my horses barefoot and I trail ride a lot and also work cattle on my horse. I do have a load of pea gravel in the common area. It’s small with round smooth edges so it helps toughen the foot and create callouses. Both of my horses have been barefoot for years. I trail ride a lot and also work cattle on my horse. I have a load of pea gravel in the common area. Pea gravel is small, round, and smooth. It helps toughen their feet and build callouses. A couple other things I’ve found out is that it’s easy to pick poop because the gravel falls through the tines on the fork and the gravel also drains well so it eliminated a muddy area for me too. It’s a pretty thick layer. 8-12 inches deep. I will also say that I boot when I know I’m going to be riding pretty rocky terrain. Or bring them along and put them on mid trail if it seems like the rocks will never end. In the spring when I haven’t ridden as much over the winter, there seems to be a bit of time I may have to boot off and on to recondition the hoof after having a break over the winter. And I also feel the need to get the hoof used to wearing the boot again so sores aren’t created on a long trail ride because she hasn’t worn the boots for a couple months. Barefoot trimmer here… the biggest problem is that this horse has flat feet as stated by the owner. Without good concavity to the hoof, there is no room for the hoof to adjust to different ground textures and especially gravel. In a hoof with more concavity (looking more like a bowl with the frog inside), the hoof is better equipped to handle different terrain comfortably. Also, similar to what Stacy mentioned, if the horse is not used to the type of terrain you are planning to ride/work on, then you should either try to work around it or incorporate it into your routine more often so the horse will toughen up to that terrain. Boots are a fantastic option to give the horse more support while allowing the hoof mechanism to still function as it should, without locking it into a rigid shoe and further limiting the health of the hoof and the rest of the body. There are many different styles of boots out there depending on your needs and the shape of your horse’s hooves. The trim itself is also very crucial, and a true barefoot trim is different from a “pasture” trim by a regular farrier. If you are looking for more information about barefoot options, I frequently post articles on my FB page at facebook.com/ProvingStrikeEquineLLC. Good luck! Great info here. Also a great description of the hoof. My mini’s were the opposite of flat footed…they looked like little tea-cups when you picked them up…and they were tough as nails! What is your opinion of how to handle barefoot if you ride so much that the hoof just gets short? Some say that the hoof will learn to grow more but I have had several horses where I either needed to make the choice to ride less (which doesn’t seem that the hoof is then growing more…I’m riding less) or put shoes on because the hoof just wasn’t growing to keep up. The work load had been gradually increased over the period of several months before the shortness became the issue. What are your thoughts? The hoof would naturally have the hoof all level with the sole but, is not flat. A horse can travel for long distances with no issues. If you are riding so much to wear down the feet, you can always boot them part time. stacy I have found that if a hoof isnt growing good some of the problem may be nutritional Try Formula4feet and see what happens next. most of our clients that have this problem will end up with a quick good growing hoof that is sound. I have one horse that nutrition helps…the rest fall into the category of…I ride a lot more than normal. Plus I wonder about the difference between a hoof keeping up with 15 miles on the prairie vs gravel, pavement and sand. But I only have this issue on horses that are being ridden a LOT. If you are riding enough to wear their hooves significantly, that’s great! Horses are designed to move 15+ miles per day over varied terrain, which is what trims their hooves. Most domesticated horses don’t come anywhere close to that much movement, so seeing wear from your riding is a good sign. That being said, very many people need to change what they see as a “healthy” hoof. Equestrian media and advertising very rarely use pictures of truly healthy hooves in articles and ad pics for leg wraps, hoof supplements, etc. If people rarely get to see what a healthy hoof should look like, then its very understandable why so few actually know! Short IS what you want. Here is an example: you are shipping a very delicate tea cup to your grandmother, how are you going to pack it? Would you wrap it with lots of cushioning material and then put it in a small box so it is tightly packed and won’t rattle around? Or a big box with no padding? Think of the internal structures of the hoof as the teacup (coffin bone, etc), the digital cushion and frog as the padding, and the hoof capsule as the box. You want all of these things tight and compact in order to support the hoof. The shape of the hoof makes a difference in how much the wear affects the hoof also. Do remember, whatever is wearing away is being removed because it is in the horse’s way of movement and affecting their breakover and efficiency of travel. This is why you still see uneven wear on shoes (usually at the toe), because the most efficient way for the horse to move may not wear them the way we “want” and the shoe does nothing to change that. If the hooves look like they are getting “too short” then that is just the horse trying to put a smaller box around the teacup! This is what we try to mimic with a barefoot trim, (in horses that need trimmed because they aren’t getting enough movement to wear down their own hooves), trimming away the hoof material that would have been worn down, and leaving the rest. If your horses are showing enough wear to make visible changes to the hoof from riding, then you have self-maintaining hooves which is the goal of every hoof trimmer! Those hooves won’t need to see the trimmer or farrier as often, and if they do they should only need a light rasping to make sure everything is staying smooth and balanced. The hoof should have a 2/3 to 1/3 balance, meaning the heels to the apex of the frog should make up 2/3, and the apex of the frog to the toe should make up the last 1/3. Rasping a rolled edge on the toe every few weeks helps to keep the hoof in correct balance, with the horse landing heel first so the hoof will get stronger instead of wearing away incorrectly. Hooves are a dynamic structure and will adjust to grow more when more wear is occurring (if it didn’t, the horses out West wouldn’t have any hoof left with the rough terrain they live on! ), but each horse varies and many things can impact the growth including weather, seasons, and any lifestyle changes. Boots can be used part time if you want to spare some hoof wear while still allowing the hoof to maintain its natural functions. For more stability in the boot, since moisture can build up and make the rubber base slick against the hoof, you can add a felt pad so the hoof is contacting a more textured material instead of the smooth rubber. Here is a link to a before (top) and after (bottom) picture of an 8 year old QH gelding with IR/laminitis issues, so not the ideal hoof shape but still shows the difference in commonly seen hoof length and a more correct length. This was his first trim with me (after pulling his shoes) and has shown even more improvement with each trim on a 5 week schedule. Hi, I like to leave my gaited foxtrotters barefoot as much as possible, have heard boots don’t work well on gaited horses due to there movement and was wondering if you had a preference or suggestion..and what is the difference between a Natural (mustang roll) and a bare foot trim? Kendra, there are many different boots out there and all fit differently depending on the shape and size of your horses’ hooves, and also how much and where you plan to use them. I like EasyBoots since they have so many different options within their own product line, and you can order a Fit Kit so you can be sure you get the right size before you order your boots. I have used the EasyBoot Trails and love how easy they are to put on, similar to the Cavallo boots. I’ve had clients and colleagues with experience in other brands as well so the most important factor is finding what works best for you. To answer your other question, what is the difference between a natural and bare foot trim, is they are pretty much the same just different names. The mustang roll is simply rasping a beveled or rounded edge on the hoof wall, usually just around the toe, which helps with breakover and prevents cracking and chipping. A true natural or barefoot trim is different than the “pasture” trim a regular farrier does, in that the natural trim balances the hoof for barefoot support and soundness, while the “pasture” trim from a regular farrier is the same trim they would use if they were preparing the hoof for a shoe, and does not correctly balance the hoof to be strong and sound without the shoe.